Sadly, I never had my own pair of ice skates, and ironically enough I can barely stand up on the things! But there’s still some sort of magic in it for me. So, I set out to find a pair. 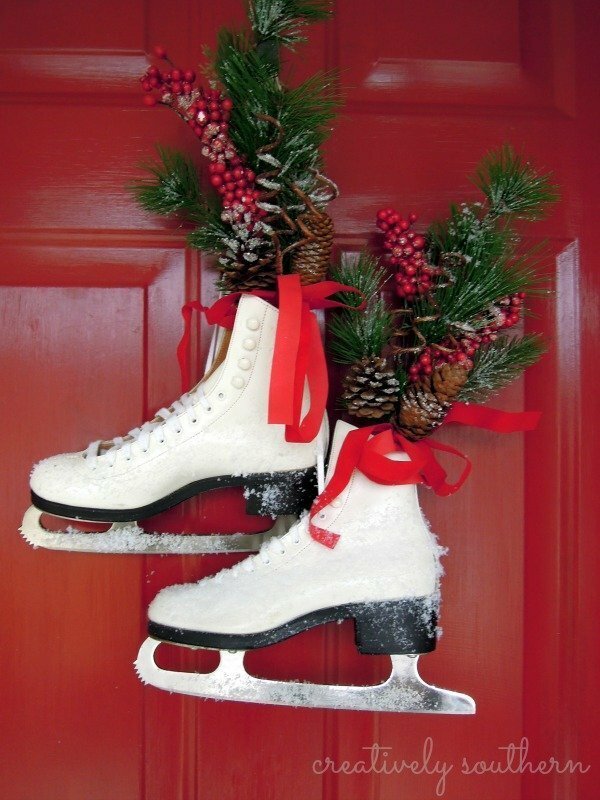 Now you may already have your own fantastic pair of ice skates, but for me I wasn’t about to fork out a whole lot of money for a pair of skates to hang on the door. Luckily, the local ice skating rink hooked me up. I managed to find a great pair of used ice skates from the Ice Chalet in town. They had several pairs of old skates that were no longer usable for skating. Totally usable for me!! I couldn’t believe how great these looked. USED??? Let me tell ya, that if my big ol’ foot would have fit in these cute little dainty 5 1/2 size skates, I would have tried. 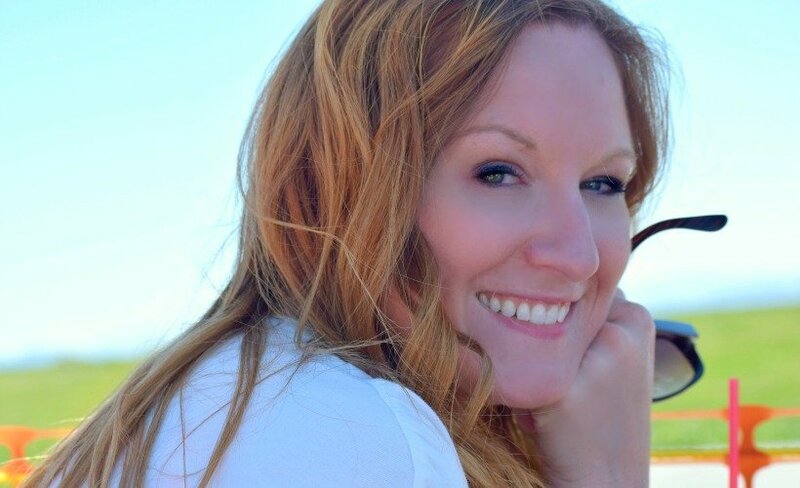 And there would be pictures… lucky for you. To decorate my somewhat shiny new used skates, I picked up some greenery from Michael’s and just dropped them in. I used some spray adhesive (mod podge works just as well) and added some buffalo flurries to the skates like I used in my easy winter snow globe. Don’t they look like they just came off the ice rink? I love seeing these on the front door everyday. Brings back some great memories and it’s nice to have something besides the traditional wreath on the front door. 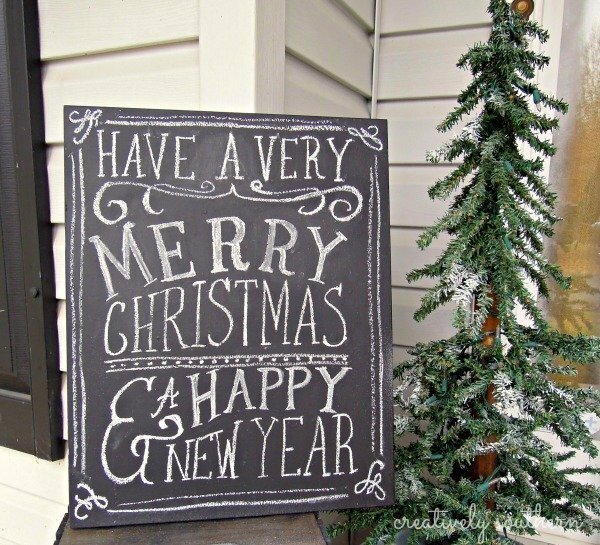 Speaking of front door… I’ve been working on getting the whole porch holiday ready. Here’s just a little peek into what you’ll see in a few days. 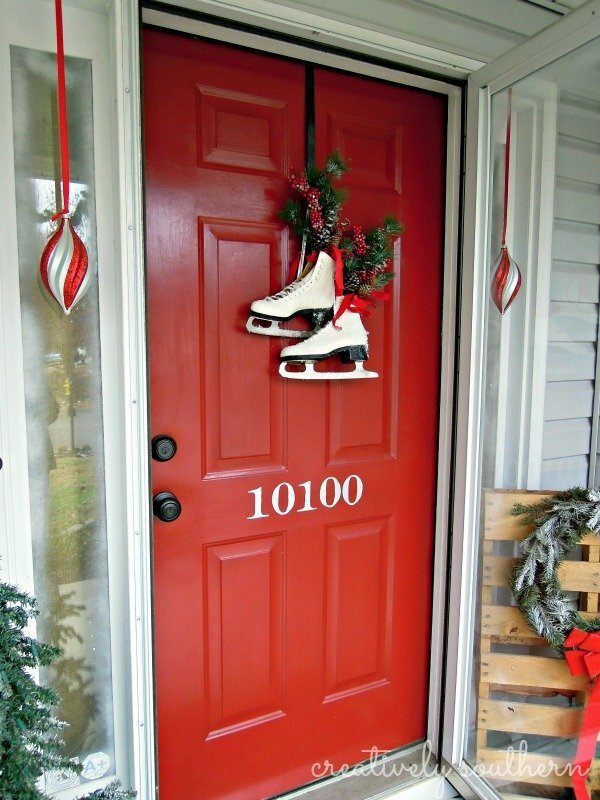 Hi, I was wondering how do you keep the skates from banging on the door when opening and closing the door? The skates are heavy enough that they didn’t bang on the door much. ? 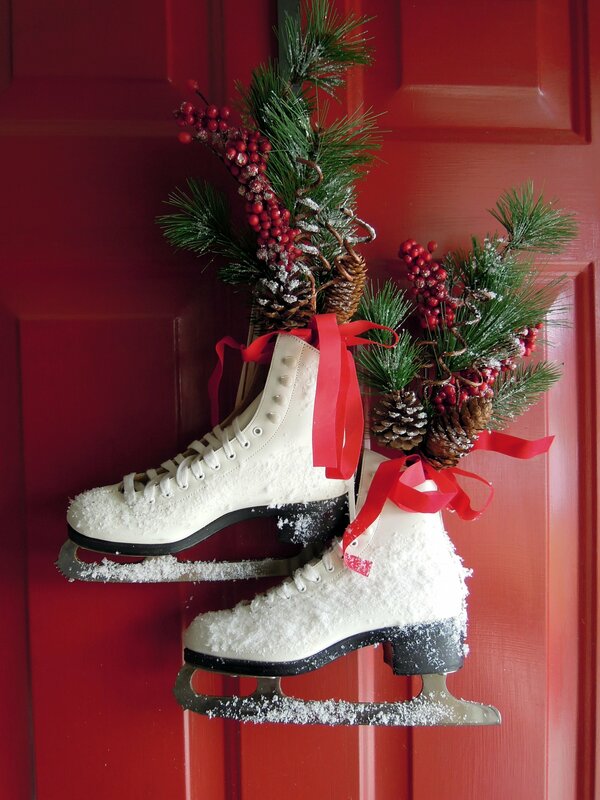 Absolutely love your door decoration with your skates, awesome and it looks gorgeous. Oh thank you, never thought about it. Our (Grand Junction, CO) ice rink has just reopened after 2 yrs. of being closed. I’ll have to give them a call to see if they have any old skates to sell. Hopefully they will as I’ve wanted a pair to decorate with for years. How did you hang them on the door. What on the skate to use as a hanger. Hi Claudia! 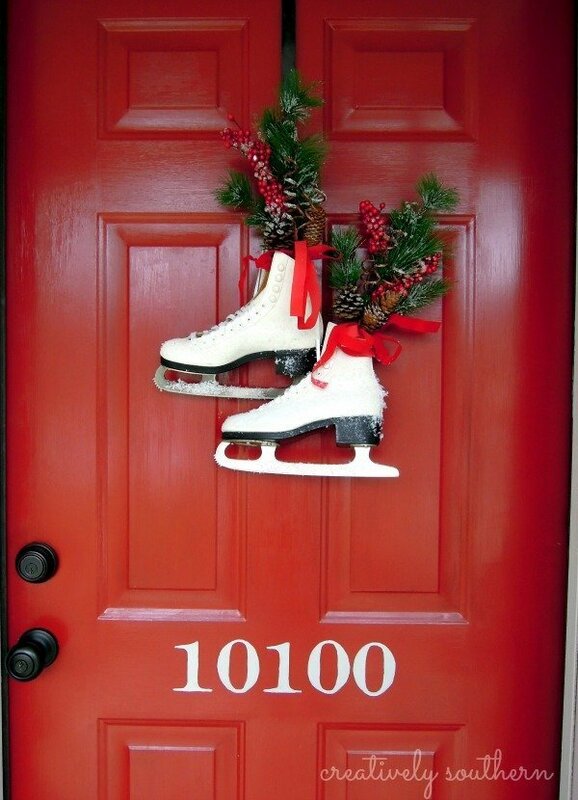 I actually used a wreath hanger on the door and then tied the laces of the skates together. So these skates just hang from the laces. Thanks for asking!